This thoughtfully designed ride through Tampa is truly a great introduction to our wonderful city. Our easy ride includes downtown landmarks, historical locations and ventures through various neighborhoods. With plenty of informative stops built in, this ride is designed to be easy for casual riders and includes a stopover in Hyde Park Village with enough time for a little exploration or a coffee (or beer!) and snack if you're so inclined. Feel free to pick the brain of your knowledgeable, local guide for recommendations for restaurants, bars, breweries, or other entertainment options. Our casual, 3 hour tour will kick of at 9:30 AM in the Channel District, 1120 E. Kennedy Blvd, Tampa, FL 33602, in the courtyard of Grand Central at Kennedy, and then we'll ride down Tampa's Riverwalk. We'll venture into downtown before heading over to the gorgeous Henry Plant Hall on the campus of University of Tampa. The Historic Hyde Park neighborhood is next with a stopover in Hyde Park Village. A trip to Tampa would be incomplete without a ride down Tampa's beautiful Bayshore Blvd, bay breezes and maybe a dolphin or two! Last stop Harbor Island. We'll provide the "Orange Fun Machine" (Comfy Cruiser Bicycle), Bottled Water, Lots of info at plenty of built-in stops, and Tons of Fun! 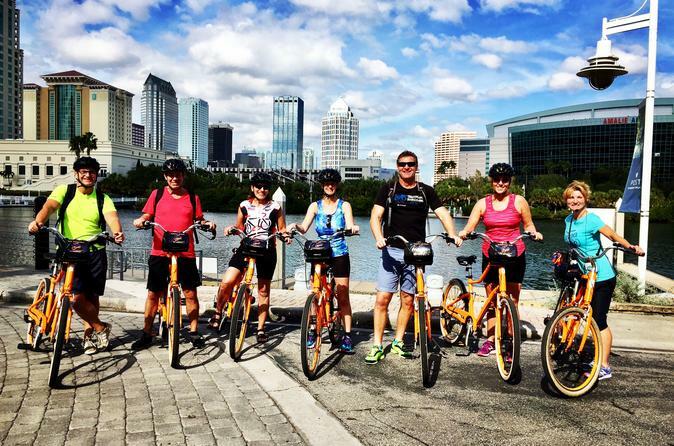 Come take a ride with us and see all that Tampa has to offer. The View is Better From a Bike!